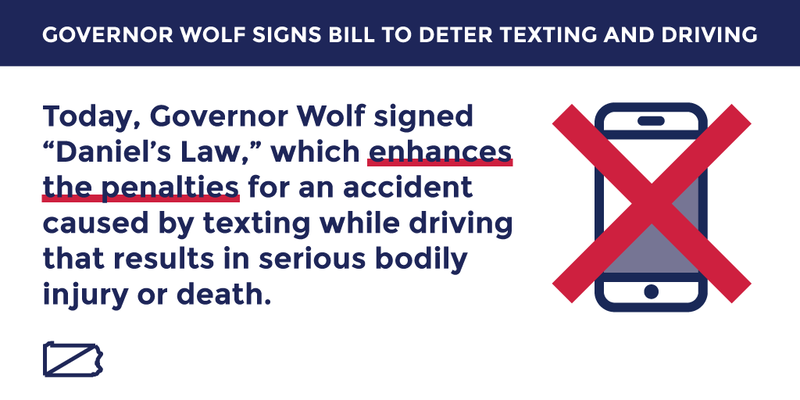 Harrisburg, PA – Today, Governor Wolf signed “Daniel’s Law,” which enhances the penalties for an accident caused by texting while driving resulting in serious bodily injury or death. “It is our hope Daniel’s Law will lead to safer roads by raising awareness of the serious consequences that can happen when you text while driving,” Representative Jaret Gibbons said. “I was honored to stand up for the Gallatin family when they came to me after suffering this horrible tragedy. While we cannot bring Dan Gallatin back, at least his family will know that through this law, his loss will help to save lives,” Gibbons said. This law is named for Daniel Gallatin, a father, grandfather, military veteran, and fireman of nearly 40 years who was killed in May of 2013 when his motorcycle was struck from behind by someone who was texting while driving. According the National Highway Traffic Safety Administration, 3,328 deaths were caused by distracted driving nationwide in 2012 and approximately 421,000 people were injured in accidents involving a distracted driver. Here in Pennsylvania, more than 14,800 crashes in 2015 were caused by this practice, resulting in 66 deaths. It is imperative that we make sure that our drivers are aware of the consequences of distracted driving to eliminate senseless deaths caused by this dangerous behavior.